All the latest news, press releases, and commentary from Heidi E. Scheuermann. Scheuermann: "So, as we look toward our future and see what work remains, it is absolutely critical that Stowe has an experienced, independent, thoughtful voice in Montpelier that is both willing and able to work across the political spectrum to advance good, sound, public policy, but also one willing to take on the special interests and fight against bad public policy." "I believe I am still that person." "Her (Heidi's) focus has been on doing what's best for our town. I have tremendous respect for Heidi's work ethic, her critical thinking skills, and her understanding that following one's moral compass is more important than blindly following the party line. Heidi has worked tireless for our town over the past dozen years, and she continues to exert the same level of energy and dedication that she always has. She is respected throughout the state, and her longevity and experience are huge assets to our town." Photo by Caleigh Cross. 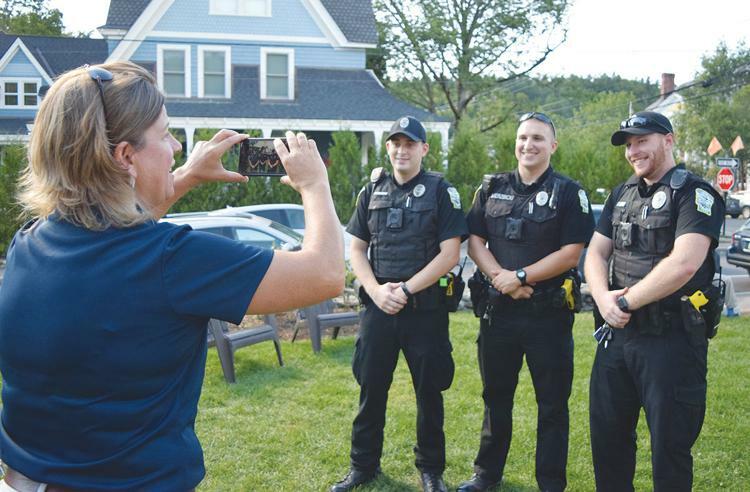 "Rep. Heidi Scheuermann takes a picture of some of the Stowe Police Officers"